When choosing a mobile device one of your primary concerns is the mobile operating system that it runs. You will need to consider the devices features and the applications (apps) that are available to support them. This varies between the Android systems, the Apple iOS and the Microsoft Windows Phone. Historically the Android devices have more mobile units, with the iOS platform running second and the Windows phone coming in last in the market. No matter the software platform, if the hardware and app are well matched the possibilities are limitless. As you can see in the use of a photo app and an on board camera below. This is a crucial cost and availability issue. Open source software if free for all to develop and market. The code of the OS is widely and freely available. Open source apps may or may not be free and may or may not be subject to the rigorous performance, compatibility and vulnerability testing required for inclusion of the app into the closed source/vendor specific platforms as you will see below. The real power of your mobile device comes from the apps available to it. The open source apps are managed and delivered Google in its Play Store. These apps are created and developed by practically anyone with the skill set to do it. 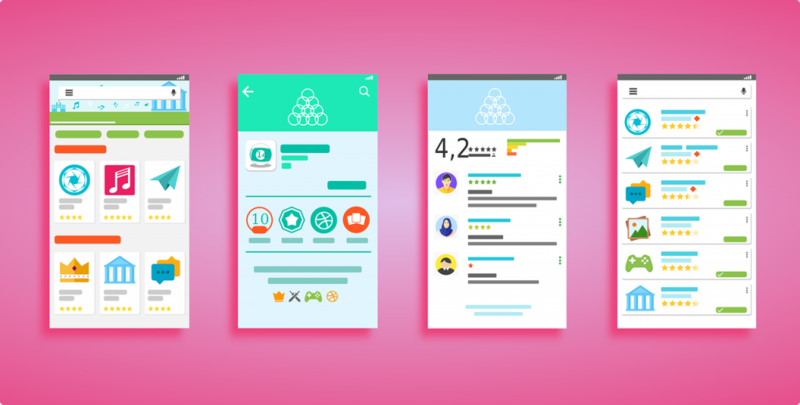 The Play Store offers developers a development package called Android Studio that includes testing tools to ensure performance. While apps in the Play Store are prohibited from blindly accessing features of your device without consent, it is not unusual for a weather forecasting app to request your location. This requires GPS access in most cases. If the app asks for the GPS and your camera you may want to think about it. The number of open source apps available in the Play Store is marginally greater than the number of apps available in the iOS App Store. Development for the App Store is a bit trickier without the OS source code. However there is a tendency to develop towards the iOS before Android. Overall the least number of apps is the Windows Store, although the development is aided with the use of Microsoft Visual Studio. Here is a look at the Play Store. Note how although sanitized you can see multiple app choices, pricing and star based user ratings. Your portable device (tablet or phone) will generally have either or both an accelerometer and a gyroscope. The functions of these two devices is dissimilar but complimentary. By itself a gyroscope can report on the rotation of the device in terms of North, South, East, and West where an accelerometer cannot. The accelerometer can distinguish movement in any particular direction where a gyroscope cannot. Combined they are very useful for general navigation and mapping as you will see. 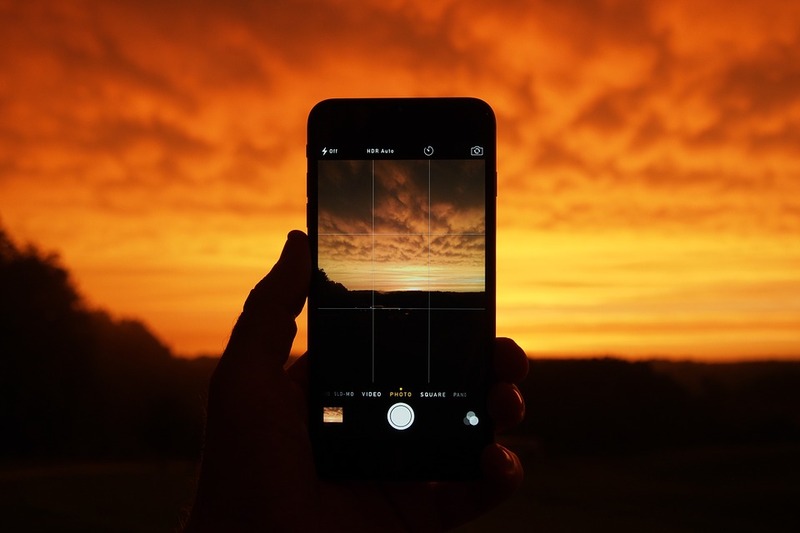 For screen orientation the accelerometer can measure the static gravity of a device giving it the ability to detect elevation, tilting and vibration. This allows for the device to rotate the display to appear optimally regardless of its orientation. Often new or recovered mobile OSs need to be calibrated on initial use or after repairs. Your indication that this needs to be done is the unpredictable operation of the touch screen either in default mode or when rotated. Your touchpad may not respond to your input or it may be misaligned causing problems using apps and particularly typing. You can rectify this condition by following the manufacturer’s instructions for your device. Also be sure that there is nothing between your fingertip and the screen like a skin or screen protector, these can degrade response. Global Positioning System (GPS) capable hardware is usually included in most mobile devices. In smartphones the GPS can receive location information from cellular towers or geosynchronous satellites. In non-cellular devices only the satellites are used. The GPS works by measuring the time signatures of at least the closest three sending objects and using the reception time differences to establish precise coordinates as a 3-D position. This is useful in mapping and direction apps where the app needs to know the starting point. If the device is aware of its location it can supply that data to the map or direction program and establish your current location as a starting point. The GPS only receives and interprets the location information. Another GPS dependent or location based process is called Geotracking. This process is location aware and can provide the applications with position data to help locate nearby goods and services. You simply ask for a gas station within five miles and the app will use your location and consult its database of known locations to provide you with choices. Handy to say the least. Here is an effective use of technology and exercise/leisure. 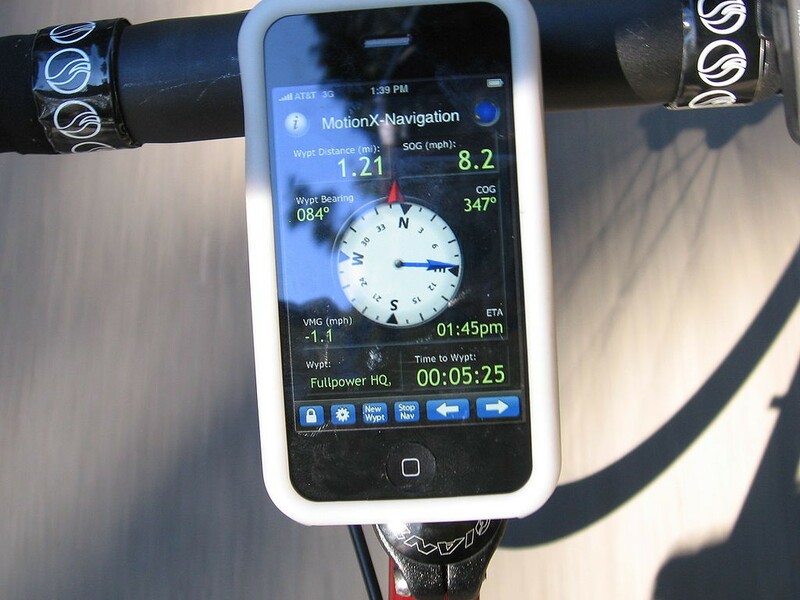 The bicycle mounted smartphone provides the user with ride metrics and routing information. Some apps support Bluetooth heart rate monitors, wheel and pedal sensors including that data in the available fields. On a typical smartphone you will have both cellular and wireless capability. The ability to make and receive phone calls using the available wireless networks represents a considerable savings if you are using metered service, additionally the wireless network provides unrestricted (free) Cloud and internet access including uploads and downloads. The Wi-Fi connection allows you to connect to your home or SOHO wireless service or if you are away from home you will be able to connect using wireless hotspots. Be careful to recognize that a hotspot is open to all. If a password is required it will be generally available. There a great many open wireless hosts provided by coffee shops, restaurants and other service providers. If you are connected to cellular service and a hotspot becomes available, your device will jump to it depending on your settings. Be advised that this switchover will cause dropped phone conversations during the transition, but your web browsing will not time out. On a mobile platform a launcher is an element of the Graphical User Interface (GUI) that is used to activate apps or menus in the iOS or Android. Generally these are small icons, in the case of Windows they are called tiles. In any case they are deployed by tapping the representation of the desired app. Gone are the days when you had to do everything manually. A premier example of that concept is the practice in newer OSes to include a virtual assistant, whether it is Cortana on Windows, Siri on iOS or Google now for Android. These assistants use all available data including any accumulated histories on the device, available to the account on other devices or on the internet to provide answers to your questions or launch apps. Simply put, every app needs to be developed. The development is accomplished by using the OS specific Software Development Kit (SDK). The SDK includes tools to work in the desired programming language and testing capability. When the testing is complete the programmer publishes the app. The publishing process for Android produces a compressed Android Application Kit (APK). Windows 8 visual studio produces either .xap or newer Application eXellence (.appx) files and the iOS produces an iPhone Application Archive (.ipa). Emergency alerts are broadcast over most cellular networks. You will receive them if you have your device configured to accept them. You will receive amber Alerts and severe weather information based on your geographic location. If you use your cell phone to call emergency services your location will be visible to the emergency service provider you call, 911 for example. In added value in mobile devices, smartphones in particular is their ability to interact with cash stand readers in order to make purchases or payments. 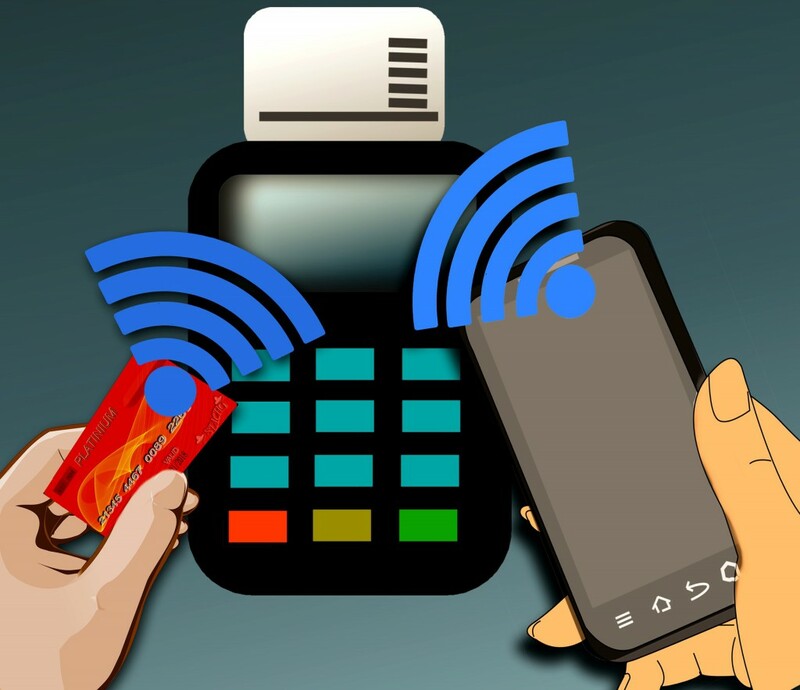 Primarily the device uses Near Field Communication (NFC) to communicate with the checkout hardware, provides the merchant with the pertinent financial information and logs the transaction. Also known as tap to pay, NFC is a low power technology that requires very close proximity (a few inches) of the devices and can be encrypted. If you are not using it you should turn it off. The security implications for eavesdropping range are not as bad as Bluetooth, but if an attacker can get close enough they can pick up the NFC signal. That’s all for 220-902 – 2.5 Exam notes. Good luck on the test!